Speak English, and you can talk to the world. Wherever you travel, speaking English will help you to make bookings, ask questions and get to the places you want to go. Without the right words, it's easy to feel lost. No one likes to feel lost when they travel. Communication is the key to a successful trip, but it's just not practical to learn the language of every country you visit. That's why EF English Live has created a simple way to learn one of the most widely spoken languages in the world: English. Our travel English course will teach you how to confidently perform everyday tasks like booking flights or hotels, confirming reservations, and asking for directions. Once you have these skills: the world is open to you. By watching our high quality language training videos, you learn useful new vocabulary and grammar in context. The video will pause to test your comprehension, and you can replay the clip as often as you need. Our handy travel vocabulary list can be downloaded to help you practice and memorise useful words with ease. Plus, our interactive exercises use speech recognition technology to record and review your pronunciation of key phrases. With instant feedback, you can perfect your spoken English skills quickly and effectively. Learn: Our high quality videos, audio and articles will teach you useful travel vocabulary and phrases. Try: Get instant feedback on your grammar and pronunciation, and test your newfound language skills with our self-study tools. Apply: Live online classes allow you to practice and perfect what you've learned with our native English-speaking and skilled bilingual teachers, along with same-level students from around the world. We're trusted to provide language training for some of the most prestigious companies in the world. They've benefitted from our flexible and specialised teaching, and so can you. 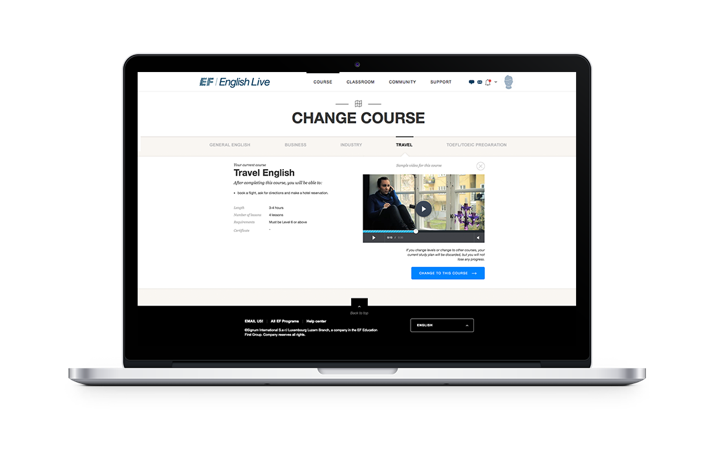 As a student of EF English Live, you'll enjoy access to our award-winning online English school where you'll be able to reinforce your knowledge of travel English with the live support of our skilled teachers and hundreds of hours of innovative study tools. Meet other students in one of our friendly group classes, or learn on-the-go with our app for iPad® and Android™ tablets. We're here 24/7 to support you on your language journey. In addition, we offer comprehensive business English and job-specific courses along with 16 levels of general English to enhance your language skills even further. One school gives you maximum results.